A winner for riders and a model for the industry to follow. 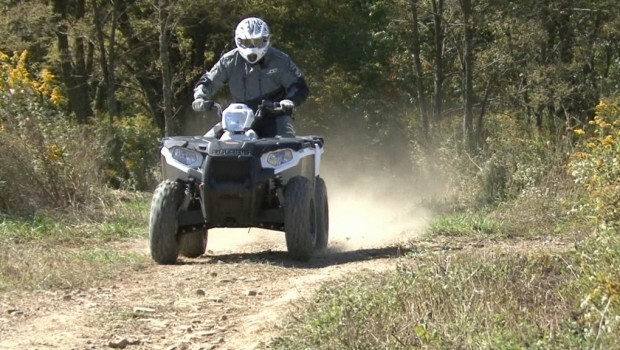 Since the debut of the Sportsman 500 in 1996, Polaris has sold over 600,000 units making the machine the best-selling ATV of all time. With enough power, stable predictable handling, and plush suspension, the machine’s performance proved to be timeless. A few years back, Polaris updated the looks of the 500, bringing its appearance into the 21st century. Its broad midsection and clunky-sounding starter betrayed the machine’s modern appearance; however, with a lower MSRP than it sold for in 1996, the 500 offered value that was unrivaled. The 567cc, four-valve, double overhead cam, water-cooled, four-stroke engine is said to produce 44 horsepower–– 22% more power than the old 500. 2014 brings about the biggest update to the Sportsman 500 in its 17 years. The dated 500 engine has been replaced with a Polaris Pro Star 570 engine. The 567cc, four-valve, double overhead cam, water-cooled, four-stroke engine is said to produce 44 horsepower–– 22% more power than the old 500. Electric fuel injection replaces the carburetor resulting in easier starting with no need to touch the choke or worry about riding at various altitudes. A new 560 watt stator allows Polaris to offer EPS-equipped versions of the 570. It also makes it easier to power various accessories that draw power. Electrical leads can be found under an access panel located in the front, semi-dry storage box. The new engine allowed Polaris to narrow the seat and side panels 3.25 inches. The slimmer ergonomics were complemented with broader floorboards, which are said to be tougher. New composite racks, now featuring exposed steel tubes, provides easier-to-use, and perhaps more secure, tie down points. The racks also allow for the easy attachment of Polaris’ Lock and Ride Accessories. Fly’s Patrol riding jacket offered versatile protection against the elements. For our maiden voyage, we dressed in Fly Racing’s over-the-boot, Patrol riding pants, Patrol jersey, F-16 gloves, and Three 4 helmet. Fly’s Patrol riding jacket offered versatile protection against the elements. Stepping aboard the machine, the improved ergonomics immediately stand out. The Sportsman is easier to grip with your knees and doesn’t force you to ride with your feet so far apart, enhancing the already plush, roomy feeling. The 570 retains the 500’s easy–to-reference combination analog and digital display. The internal sound of the Pro Star 570 is quieter and more pleasant from the moment you turn the starter key. Vibration levels also seem to have been reduced with the new engine. While the old 500 had decent power, the 570 is clearly less labored, cruising the trail at a lower RPM. From a dead stop, there’s enough low-end grunt to bring the front wheels up on the 702 pound machine with a little tug on the handlebars When you open up the throttle exiting corners, the increase in midrange power is apparent. The motor seems to rev a little faster as well, especially when you grab a handful at speed. the increase in midrange power is apparent. The motor seems to rev a little faster as well, especially when you grab a handful at speed. The CVT transmission engages smoothly low in the RPMs. Paired with the more potent engine, the Sportsman’s fun factor has been raised this year. The CVT transmission engages smoothly low in the RPMs. Paired with the more potent engine, the Sportsman’s fun factor has been raised this year. With high and low forward ranges in the transmission, the extra power will come in handy for getting work done, but we were more enthusiastic about how it ripped through the trees. The Polaris 2wd/all-wheel-drive system is sort of a no-brainer. Leave the machine in two-wheel-drive for dry conditions or when you want to be free to slide around. If you want predictable, more consistent traction, click it into AWD. When the rear wheels start to break traction, the front wheels will lock in and provide four-wheel-drive until you let off and reapply the throttle. If traction is available, the drive system won’t resume applying power to the front wheels. We rarely miss full time four-wheel-drive with this system. The chassis and suspension do a good job of handling the extra power the 570 produces. The 48 inch width and 50.5 inch wheelbase work in conjunction with the IRS’s rear sway bar providing a stable ride on corners and side-hills. There is some front-end dive on corners, but you can easily overcome it by leaning in a bit more or using the engine to step the rear end out a little. The chassis and suspension do a good job of handling the extra power the 570 produces. Steering is pretty predictable with a hint of understeer. We’ve found the Sportsman’s steering light for the machine’s weight. 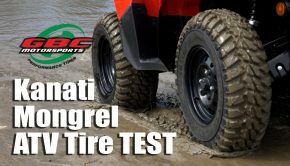 Of course, having tested the $7,299 Bright White EPS model, the EPS-equipped machine enjoys super light steering at a snail’s pace, and bump feedback is dramatically reduced. The non-EPS model is $800 less expensive and very manageable. having tested the $7,299 Bright White EPS model, the EPS-equipped machine enjoys super light steering at a snail’s pace, and bump feedback is dramatically reduced. We found the suspension ample on the 500 and well matched to the 570. While the McPherson struts are a dated design, they perform pretty well and control 8.2 inches of travel. The sway bar-equipped IRS features 9.5 inches of travel. The Sportsman’s suspension is plush yet responsive. It works well on rocks and on lower speed bumps. The suspension remains pretty predictable on whooped-out trails and we rarely ran out of suspension travel on g-outs and bigger hits. Disc brakes front and rear do a good job of slowing the 570. There is the usual handlebar-mounted brake lever which activates both the front and rear brakes, along with a foot brake that operates the rear brake independently, which is nice for technical descents. The transmission features a convenient park selection, so there are no parking brakes to adjust or fail. The new racks will let you haul 90 pounds front and 180 pounds rear. The new racks will let you haul 90 pounds front and 180 pounds rear. There’s also 6.5 gallons of semi-dry-storage under the front rack. The on-board storage makes this machine ideal for campers and outdoor adventurers. A 1.25 inch hitch receiver will let you tow an additional 1,250 pounds. This year the MSRP for the non-EPS-equipped Sportsman has ticked up just a bit to $6,499; what it retailed for in 1996! Yes, for the 17-year-old retail price of the Sportsman 500, you get a machine with nearly two decades of minor refinements, modernized styling, a proven chassis that performs well, plus refined ergonomics, a new generation higher-performance engine, and fuel injection seemingly thrown in for free. At $6,499, Sportsman 570 leaves us with a few questions. 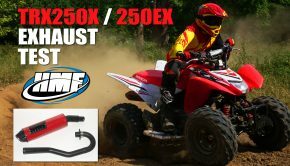 Why can’t we get a 400cc or bigger sport quad for $5000 or less? 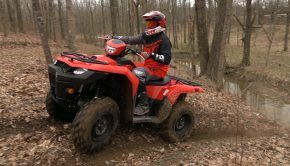 How can Polaris sell a full-size 570 4×4 at a compact 400cc price? Machines like this are what is needed to get consumers fired up and buying, and Polaris has the sales numbers that prove it. The 2014 Sportsman 570 makes you feel like you got more than you paid for. What the Sportsman delivers for the money is unparalleled. Polaris continues refining many of their dated machines, keeping them modern and their prices a generation behind. The 2014 Sportsman 570 makes you feel like you got more than you paid for. Summary: What the Sportsman delivers for the money is unparalleled. Polaris continues refining many of their dated machines, keeping them modern and their prices a generation behind. The 2014 Sportsman 570 makes you feel like you got more than you paid for.